Archaeologists are a bit sniffy about us dowsers. They think dowsing isn’t scientific enough for them, that our results are not proven. And yet, more and more of them are to be seen quietly having a go with the dowsing rods, and taking an interest in what we say. On one site we were investigating recently, Longbrook Camp near Minsterworth in Gloucestershire, they wheeled out their experts and electronic gizmos, and couldn’t find a thing! We were able to tell them why - there was plenty there: lots of Iron Age round houses and several from the Bronze age too, plus three larger ones from around 270-280 B.C. There was a crop growing area and a burial ground, plus a boat building workshop adjacent to the river. And it was the river that, over the centuries, had deposited silt on the site every time it flooded, so that everything was at least two metres below ground level, too deep for the experts and electronic gizmos to detect. During his talk on Saturday 24th September on the best ways of recording archaeological dowsing results, Barry Goldring reported that he is not above using a few electronic gizmos himself. He uses a GPS to identify map co-ordinates and location, and results can be downloaded and plotted on computer. He also has a lazer distance meter, which allows him to stand in one place and aim the beam on a distant object to obtain a reading accurate to within 2mm. It saves a lot of walking too, but can be difficult to hold steady. 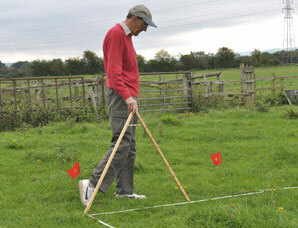 Barry Goldring reveals his secret weapon for accurate measurement when archaeological dowsing. Traditionally, however, taking bearings with an old fashioned compass, measuring with a tape measure or wooden rule, marking with flags, recording on a clipboard and plenty of graph paper for plotting it all afterwards, are always reliable, and indispensable when the batteries run out. Barry then revealed his secret weapon, a wooden measuring stick he made himself with a design heavily based on the geometry dividers we all used at school. After all, the main aim when recording anything is of course accuracy. Showing the results as professionally as possible is not only useful but important to our credibility - especially when the experts can’t find anything at all! Our next meeting will be on Thursday 13th October when Terry Shubrook talks about distant surrogate kinesiology - healing by remote control. Excitingly, we will also be launching our new book, This Rabbit is Constipated, which includes all the write ups that have appeared in the Gazette over the last five years, plus a few extra for good measure.